When you purchase commercial real estate, one of the top 5 things you need to know on day one should be the parking requirement. Parking requirements are established by the Department of Planning in the Parish where the property is located. If the property is located in an incorporated city such as Kenner, they will have their own zoning codes which override the Parish zoning codes. The Planning Department also includes departments regulating zoning as well as code enforcement, and you need to meet or, at least, talk to all three before you make an offer to buy any New Orleans commercial property. Here is an example. Say you want to buy land and build an office building in Jefferson Parish. You have 20 employees and need approximately 2,500 square feet of office space and parking for employees and a few customers. The zoning is BC-2, and the lot you are considering measures 60 feet wide by 100 feet deep. 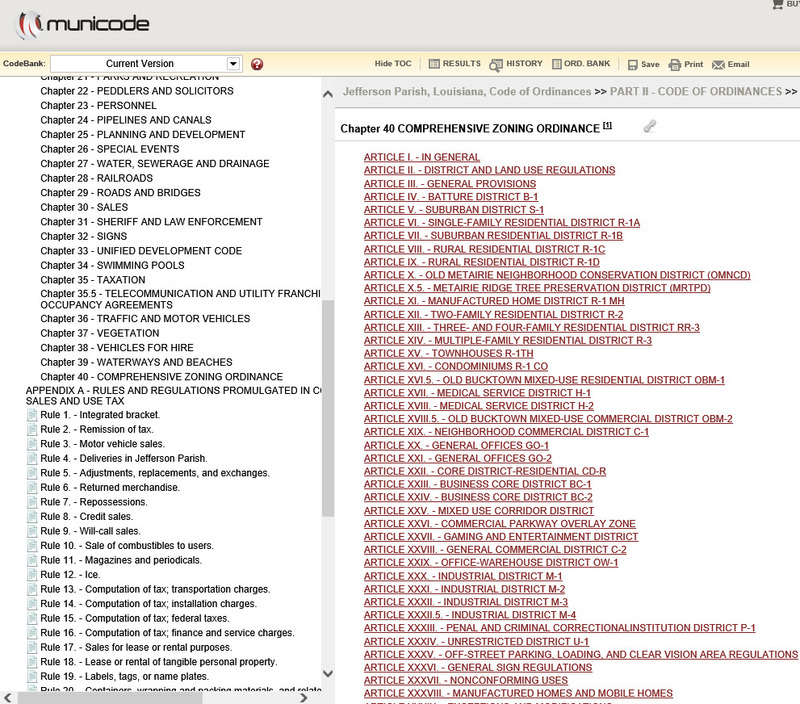 First you need to confirm zoning district BC-2 allows office buildings. Jefferson Parish allows you to confirm the zoning using an overlay map. All you have to do is insert your target property street address on their GIS Property Website, http://jp-appserver.jeffparish.net/webapps/webmap/. Since vacant land often has no known address, select a nearby building with an address, then click your target site from the GIS map to bring up the lot description and zoning information. This district encompasses an area of high density and intensity development situated on principal thoroughfares and represents an urban mixed-use core. The areas of high intensity development contain office, retail, and service uses and represent a local and regional employment and shopping commercial center. They also contain dense residential development as single uses or mixed with commercial uses to create an urban environment with diverse choices for living and working. (1) Any existing stand-alone one-, two-, three-, or four-family residential dwelling shall be considered as a conforming use. However, the existing stand alone one-, two-, three-, or four-family residential dwelling shall not be restored if it is destroyed beyond seventy-five (75) percent or more of its value. There was nothing about allowing office buildings, but we need to read the code further. The code further describes a whole host of permitted uses , including banks, bakeries, barber shops, bars, tailors, garages, hospitals, hotels, offices and restaurants, et cetera. Look for your specific business in that description and if it is not mentioned, call the planning department for verification in writing. A setback is the distance from the curb from which no buildings can be erected. Using the Area Regulations below for BC-2, a building needs to be 20 feet from the curb, and 10 feet from each side and 15 feet from the rear lot line. So if our lot is 60 feet by 100 feet, our building can be no larger than 65 feet by 40 feet. The following regulations shall be for structures sixty-five (65) feet or less in height. Regulations for structures exceeding sixty-five (65) feet in height are stated in the site plan review section of this list. 1.All structures shall be a minimum of twenty (20) feet from the street right-of-way. 2.On through lots the required front yard shall be provided on both streets. 1.All structures shall be a minimum of ten (10) feet from the property line. 2.On the side of a lot abutting a residential district or a residential structure, there shall be a side yard having a minimum width of fifteen (15) feet. 3.On corner lots the side yard on the side of the lot abutting the side street shall not be less than ten (10) feet. 1.All structures shall be a minimum of fifteen (15) feet from the property line. 2.On the rear of a lot abutting a residential district or a residential structure there shall be a rear yard having a minimum depth of twenty (20) feet. 1.Each lot shall have a minimum lot width of fifty (50) feet and a minimum lot depth of one hundred (100) feet and contain five thousand (5,000) square feet of lot area. 2.When living facilities are erected above or in connection with other uses, the lot area per family regulation shall be the same as those in the R-3, Multiple Family Residential District. Height, area, sign regulations and site plan reviews are explained, but off-street parking is referred to in Article 35. Each use requires a different parking requirement, usually according to square footage. Notice General Business and Retail require one parking space for every 200 square feet of gross floor area but Business and Professional Offices require only one space for every 300 square feet of gross floor area. For a 2,500 square foot building, we would need 8.33 parking spaces. If the calculated number is less than 1/2, you can round down, but if were over 8.5, we are required to round up to 9 parking spaces. 1½ spaces for each station, tee, or 2 holes. (2)? Automobile Repair Garage One (1) space for each employee. (3)? Bowling Alleys Five (5) spaces per alley. (4)? Batting Cages Outdoor: Two (2) spaces per station Indoor: One (1) space for each two hundred (200) square feet of gross floor area. (5)? Business and Professional Offices One (1) space for each three hundred (300) square feet of gross floor area. (6)? Child Care Center Four (4) spaces plus one (1) space per five hundred (500) feet of gross floor area. (7)? Churches, Temples and other Places of Worship One (1) space for each ten (10) seats in main auditorium. (8)? Clinics One (1) space for each four hundred (400) square feet of gross floor area. (9)? Clubs and Lodges One (1) space for each three (3) members plus one (1) space for each sixty (60) square feet of gross floor area that is available to the general public. (10)? Commercial Amusement activities One (1) space for each two hundred (200) square feet of gross floor area. (11)? Commercial Manufacturing and Industrial Establishments not catering to Retail Trade One (1) space for each three (3) employees on the largest work shift plus one (1) space for each company vehicle operating from the premises. (12)? Dance Halls, Exhibition Halls, Bingo Halls and Places and Gymnasiums One (1) space for each sixty (60) square feet of gross floor area.
? ?Multiple-family One and one-half (1.5) spaces per dwelling unit. (14)? Elderly Housing and Assisted Living Facility One (1) space for each two (2) Assisted Living Facility dwelling units plus one (1) additional space for each four (4) employees on the largest shift. Parking for any use other than allowed under the definition of Assisted Living Facility as stated in section 40-3, Definitions of this ordinance, shall be determined in accordance with the requirements for the individual use and shall be computed separately. Elderly Housing – One (1) space for each dwelling unit plus one (1) additional space for each four (4) employees on the largest shift. Parking for any use other than allowed under the definition of Elderly Housing as stated in section 40-3, Definitions of this ordinance, shall be determined in accordance with the requirements for the individual use and shall be computed separately. (15)? Furniture Store, Appliance Center and Computer Stores One (1) parking space for every three (3) employees plus one (1) parking space for each six hundred (600) square feet of gross floor area. (16)? Casino, Gaming Establishments and/or Gaming related activities and accessory uses 1. One (1) parking space for each fifty (50) square feet of gaming area, plus one (1) space for each employee at the maximum shift. 2. Bus parking shall be provided at a rate of one and one-half (1.5) percent of the above required parking spaces. 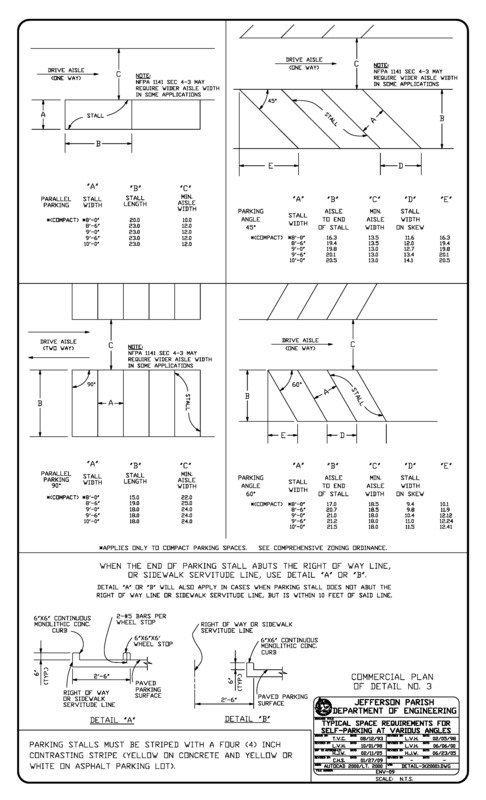 The minimum bus parking space shall be a minimum of twelve (12) feet in width and forty-five (45) feet in length exclusive of access or maneuvering area, ramps and other appurtenances. 3. On-site accessory uses or structures shall provide off-street parking in accordance with the requirements otherwise listed in Article XXXV, Off-Street Parking, Loading, and Clear Vision Area Regulations. (17)? General Business, Commercial or Personal Service Establishments, catering to retail trade, including “Supermarkets” One (1) space for each two hundred (200) square feet of gross floor area. (18)? Home Occupations One (1) space in addition to the parking space(s) required for the residential use. (19)? Hospitals One (1) space for each four (4) beds plus one (1) space for each staff doctor plus one (1) space for each four (4) employees including nurses. (20) Hotel One (1) space per guest room; plus one (1) space for every two hundred (200) square feet of gross floor area used for restaurants and lounges; plus one (1) space for every two hundred (200) square feet of gross floor area used for convention facilities, meeting rooms, banquet halls, or similar uses. (21) Kennels and Animal Hospital One (1) space for each four hundred (400) square feet of gross floor area. (22) Kindergartens, Family Day Care Homes, Nursery Schools or Pre-Schools One (1) space for each ten (10) children. (23) Libraries and Museums One (1) space for each four hundred (400) square feet of gross floor area. (24) Mini-Storage Structure One (1) space for each three thousand (3,000) square feet of storage area or one (1) space per one hundred (100) storage units, whichever is greater. (25) Motel One (1) space for each guest room plus one (1) additional space for manager. (26) Nursing and Convalescent Homes and Institutions One (1) space for each eight (8) beds. (27) Off-track wagering facilities One (1) space for each fifty (50) square feet of floor area used for video poker (if applicable) plus one (1) space for each remaining one hundred fifty (150) square feet of gross floor area. (28) Printing Establishment One (1) space for each employee plus one (1) space for each company vehicle operating from the premises. (29) Restaurants and Lounges One (1) space for each one hundred fifty (150) square feet of gross floor area. (30) Riding Stables One (1) space for each four hundred (400) square feet of covered area of such stable. (31) Roadside Stands Five (5) spaces for each such establishment. (32) Schools, Dancing and Music One (1) space for each ten (10) pupils or students. (33) Schools, Public and Private Elementary and junior high schools, two (2) spaces per classroom, laboratory or manual training shop. High schools, eight (8) spaces per classroom, laboratory or manual training shop. Colleges, universities, trade, industrial and business schools, ten (10) spaces per classroom, laboratory or other teaching room. (34) Schools having Auditoriums, Gymnasiums, or Sports Arenas Schools with such facilities shall have parking that accommodates the highest number of parking spaces required when the required parking spaces for the school and each such facility are calculated; i.e., the use requiring the highest number of parking spaces shall be the parking requirement that applies. (35) Skating Rink One (1) space for each one hundred fifty (150) square feet of gross floor area. (36) Theaters, Auditorium, Sports Arenas and Places of Public Assembly One (1) space for each three (3) seats or twenty (20) spaces per athletic field without seating. Multipurpose athletic fields without parking shall provide parking for all possible field arrangements; e.g., one (1) football-sized field that will also be used for two (2) baseball diamonds shall provide parking for two (2) athletic fields. In our example, we have 20 employees and need at least 20 parking spaces, even though only 8 parking spaces are required. The Jefferson Parish website http://www.jeffparish.net/index.aspx?page=229 spells out the requirements for parking spaces in a pdf at http://www.jeffparish.net/modules/showdocument.aspx?documentid=1013. The required stall dimensions are 9 feet by 18 feet with a travel isle of 24 feet. So for a parking area for 20 employees you could place 10 parking spaces on each side of the lot with the 24 foot travel isle in the middle. This would take up 90 feet since each of the 10 parking spaces is 9 feet wide, and would require a width of 60 feet, since two rows would be 18 feet each plus a 24 foot travel isle. So your parking area is 90 feet by 60 feet. Since your lot is 100 feet by 60 feet, you will need to build your building raised with parking underneath, and you will have 10 feet left over in your 20 parking spot office building. One more requirement: the parking area cannot include the support columns of a raised building. If each column in your raised building is 2 feet square, then you can have no more than 5 support columns in each parking area which would take up the left over 10 feet in your 20 parking spot lot that requires 90 feet of the 100 foot lot. So now you know where to find your zoning, how to determine what permitted uses the zoning allows, and how to determine the parking requirement and where to find it. You also now know that you need to build your 20 parking space building above the ground with five support columns nine feet apart on each side, and that in zoning district BC-2 you are only required 8 parking spaces but are permitted for office use.